We thought we could improve the strategy, which needed a new look as well as a larger size and frequency. It's amazing the incredible amount of print and Web ad revenue opportunities waiting for you in this recession if you just focus on proving response. This strategy was created during our recent Web-based one-on-one target account sessions (part of our Response Oriented Selling course) with a major daily newspaper out West who has been generating hundreds of thousands of dollars using our techniques. Last year at this time the advertiser was running a 1x3 (right). With the new print and Web ad strategy and presentation, the business has now signed up for a high-frequency, two-month run of 1/2- and 1/4-page ads in process color, along with 30,000 Web impressions. They're even running some classified listings for used equipment. How did the ad rep pull off such a transformation? By developing a great strategy and then using our unique approach to help prove to the advertiser that this new strategy wasn't a risk at all, but actually a much safer bet than what they had been doing. I'll explain how she did both. So she did her homework, learning about their business, competition, and target customers. She also found out why people choose one place rather than another to purchase antique firearms and related items. 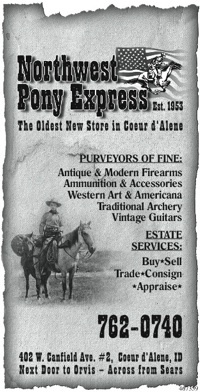 It turns out, while selection is a major reason, it was equally important to prospective customers that the people really knew their products--in this case they were trained experts and craftsmen who could refinish and rebuild the firearms and tell you just about anything you need to know about them. The ad rep also found out that the the target customers' shopping companions (who may not be quite as interested in guns) often needed to know there would be other items in the store of interest to them. Creating an effective print and Web ad as well as using the accounts' own life experiences to illustrate the various ad effectiveness concepts helped the ad rep convince the account that the content, size, and frequency was a safe investment. As you can see, the "after" ad they ran has a strong attention-grabbing graphic specific to their target customer, and the new headline sums up what people care about--a wide selection and firearm experts on hand. 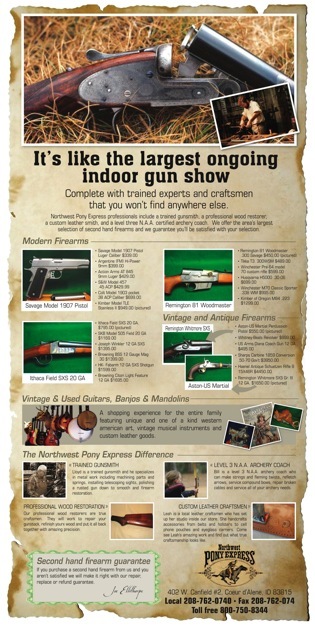 The ad then moved on to prove they had a great selection of not just firearms but many other items that the buyer's companion might be interested in. The ad then shared why they're truly experts in their field and finished with a guarantee--something many buyers feel is critical. How did the ad rep actually sell the larger ad? With our unusual set of techniques that involve drawing a new approach out of the account using the Socratic method of teaching. Instead of simply presenting the ad and explaining why it would work, the ad rep first shared with the advertiser our logical, step-by-step approach to direct response advertising. Since most businesses have their own ideas about their ad's size, frequency, and content, the ad rep gained buy-in to the new approach by illustrating each step with examples of things the prospect does in other areas of his life. We call this little 2-minute lesson the "Response Model", and it transforms the dynamic of the sale. The ad rep then was able to present the ad and explain why the techniques were based not just on her opinion, but on the way the prospect already sees the world. This use of the Socratic method to teach our approach has an added benefit as well: The ad rep also buys into it, no longer fearing that the advertiser's larger investment won't pay off. A truly win-win situation made possible by an innocent little approach that focuses in on proving response, which, as we all know, is the only thing that motivates the customer to run, and run the right size, frequency, and content in the first place. Are your ad reps able to create ad strategies that will work the first time? And when they do, can they sell the size, content, and frequency that's in the best interests of the customer, or are they slowed down by what the prospect believes they can afford or a number of other excuses like the recession, high ad rates, and cheaper competitive media? Contact me and I'd be happy to show you the exact techniques behind the sales on this blog in a Web meeting. You can reach me at (631) 477-2505 or at mcinnis@ads-on-line.com. 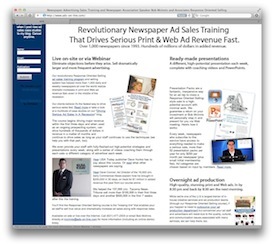 Clients of the Response Oriented Selling course or DesignYourAd Overnight Ad Production service have access to this ad, the others in this blog, as well as a huge library of ads we've amassed over the years.